I was reading the following article today (found below) and was reminded of an important lesson in leadership. You are only a leader if people actually follow you. Gary Pinkel, head coach of the University of Missouri's football team, has had his share of miscues both on the field and off during his successful tenure at Missouri. However, it is apparent that his players and coaches follow him. Why is this? How does this happen? Coaches must learn how to motivate their teams to reach their fullest potential. There are many different ways to motivate individuals/teams and there is no single way that works universally. It has been said that people (or players in this case) don't really care how much you know until they know how much you care. I believe this to be the case with Coach Pinkel and indicative of how he runs his program. Below is the aforementioned article and an example of how Coach Pinkel motivated his team by deferring the task to his outgoing seniors before they played in yesterday's Independence Bowl. 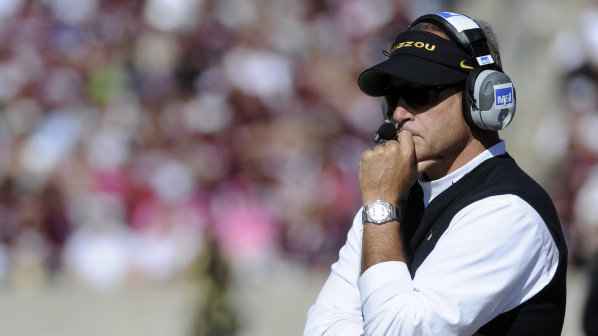 Out of nowhere, Missouri coach Gary Pinkel reached into his pocket and pulled out a crinkled piece of paper. This was Monday night, the aftermath of Missouri’s convincing 41-24 win over North Carolina in the Independence Bowl, and Pinkel – who was smack dab in the middle of the post-game press conference – pulled out this mysterious sheet of paper in the middle of his response to a question. He was in the middle of talking about why this win was important, and it turns out this paper had the answer. Before the game, Pinkel said he sent his seniors into a room, where he ordered them to come up with a list of reasons why Missouri needed to win this otherwise middling game, a showdown a day after Christmas in a city that isn’t necessarily a traveler’s dream. 1. Possible top 25 finish. 3. Finish the season with four wins in a row. 4. Win a bowl for the first time in three years. 5. Get momentum going into the SEC next year. 6. Seniors will win last game as a Missouri Tiger. 8. The game would be the first time many of them have played against an ACC school. 9. The game is the last time this group would play together. Sounds like enough to play for? You bet. And better yet, Missouri senior nose guard Dominique Hamilton said the list was a team effort, one all the seniors contributed to. Missouri went on to beat North Carolina and win the Independence Bowl 41-24.